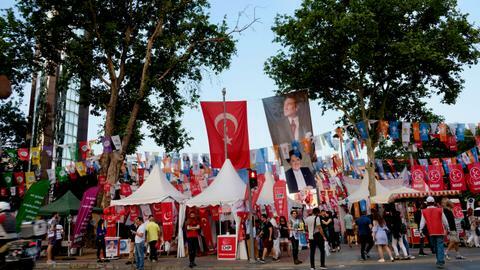 Ankara has confirmed six candidates who will stand in the presidential election on June 24, as the nation heads to the polls to elect both their new president and new members of parliament. 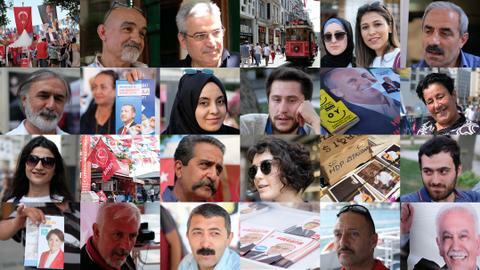 Turkey's Supreme Election Board has released a list of unofficial candidates for the June 24 presidential election. It comes after President Recep Tayyip Erdogan on April 18 called parliamentary and presidential elections for June 24, more than a year ahead of schedule, to switch to a powerful executive presidency approved in a referendum last year. 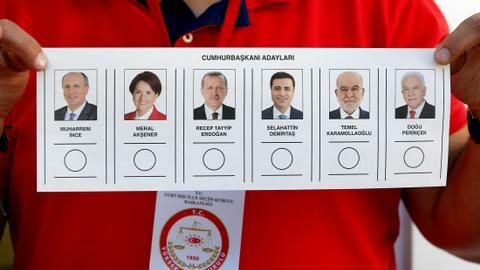 According to the list – which can be challenged until May 11 – six candidates will run for the presidency in Turkey: Recep Tayyip Erdogan, Muharrem Ince, Meral Aksener, Selahattin Demirtas, Temel Karamollaoglu and Dogu Perincek. The first round of voting will be held on June 24. If no candidate has obtained more than 50 percent of the vote, the second round of voting will be held on July 8. 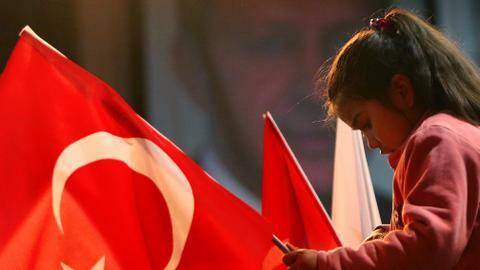 The Turkish Supreme Election Commission will announce the final result on July 12. 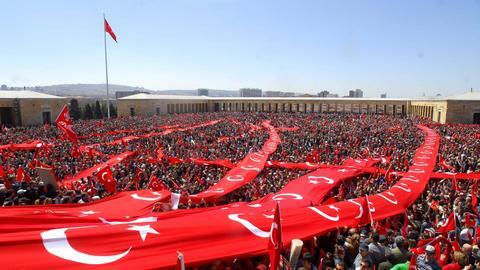 Erdogan who is seeking his second term as president is the joint candidate of what’s called the People's Alliance – made up of the governing AK Party (Justice and Development Party), the MHP (Nationalist Movement Party) and BBP (Great Unity Party). Erdogan told a crowd in Istanbul on Friday that he had always promised to be a "different president" who would not shirk responsibility. He has been on the road for months shoring up support with multiple daily speeches. Erdogan has served as president since 2014 – Turkey's first popularly elected president. Before that, he served as prime minister from 2003 to 2014. Should he win the June election, Erdogan would be Turkey's first leader under the presidential system, doing away with the prime minister's post, among other changes. Erdogan remains the most influential candidate, while Muharrem Ince, candidate of Turkey's main opposition CHP, as well as IYI Party leader and presidential candidate Meral Aksener pose the biggest challenge to Erdogan's re-election. The Nation's Alliance is made up of the CHP, IYI Party, Saadet Party and Demokrat Party in a bid to weaken the governing party's 16-year dominance in parliament. The parties have nominated their own presidential candidates to run against Erdogan but will run as an alliance for the parliamentary election, which is scheduled for the same day. The alliance statement said it brings together "different lifestyles and political opinions" under democratic principles for peace and stability in Turkey. The CHP has nominated Muharrem Ince as its presidential candidate for the June 24 snap elections. In a rally in the capital Ankara, CHP leader Kemal Kilicdaroglu formally announced the CHP's choice of Ince as their presidential hopeful. Ince, a lawmaker from the northwestern province of Yalova, vowed to make amendments to an ailing economy suffering double-digit inflation, a gaping current account deficit and a slide in the lira of more than 10 percent against dollar this year. IYI Party has circulated a petition to make party leader Meral Aksener their candidate in the presidential elections. Aksener surpassed 100,000 signatures to be a presidential candidate in the upcoming elections. On April 22, 15 deputies from CHP resigned to join the IYI Party to make it eligible to form a group in parliament. She defected from Turkey's main nationalist party allied with Erdogan, whose leader Devlet Bahceli called for the early elections. Saadet (Felicity) Party declared its chairman, Temel Karamollaoglu, as their presidential candidate. Karamollaoglu also surpassed 100,000 signatures to be a presidential candidate. The opposition HDP (People's Democratic Party) that has been kept out of the alliance announced jailed former co-leader, Selahattin Demirtas, as its presidential candidate. In November 2016, Demirtas together with 12 HDP lawmakers, was arrested on the PKK-related terror charges. Demirtas remains in custody pending trial. Demirtas accepted the nomination with a letter from his prison in western Turkey, calling on supporters to "be my hand, my arm, my voice, my breath." Lastly, Dogu Perincek – chairman for Vatan (Patriotic) Party - surpassed 100,000 votes to become eligible for being a presidential candidate. The upcoming election is Turkey's first general election after the presidential system was amended in 2017. Across the country, expectations are high for the next government.